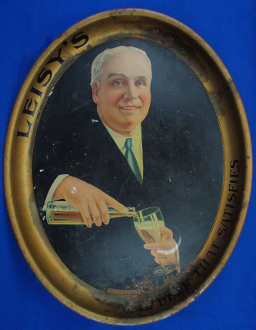 Leisy's The Beer That Satisfies The Connoisseur oval beer tray measuring 16 1/4" x 12 3/4" x 1 1/8". Circa 1912. The tray has a copyright of 1912 The American Art Works, Coshocton Ohio. Tray has some staining, scratches, wear and rust. Typical wear for a tray over 100 years old. Tray displays nicely.